bachelor robinsons known as the tin works then became Vulcan materials. then finally AMG resources the works is still there but has been sold. 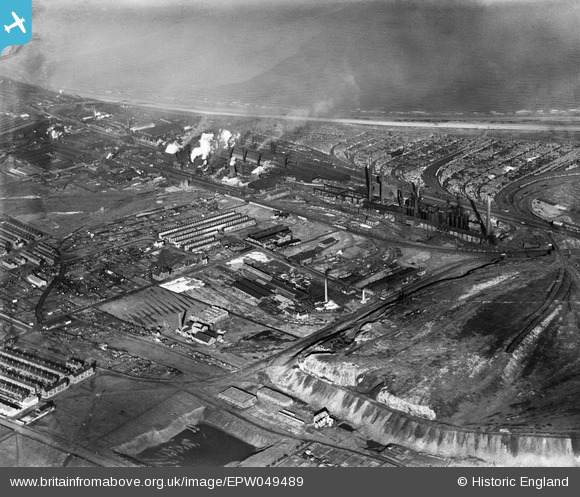 Early 20th century extractive industry to the south of Longhill: brick works, clay pits and slag heaps. Most of this area has been reclaimed since the 1960s for modern housing, industrial estates, open space and new roads. Engineering works, saw mills and extensive timber yards to the north and west of the main iron and steel factory. Terraced housing on Florence, Hill and Portland Streets, long since demolished. Hartlepool had lost most of its heavy industrial heritage by the 1970s and the areas previously occupied by the South Durham Iron & Steel works became covered in a mixture of light industrial estates, some of which were in place during the immediate postwar years. This view, taken looking north-west towards Hartlepool Bay, with the plumes from the smoking chimneys being carried out to sea on a brisk westerly wind. This large-scale manufacturing industry developed in the second half of the 19th century and was partially responsible for the rapid growth of West Hartlepool, from a population of 14,515 in 1861 to 68,135 70 years later. The merger of the Cargo Fleet Iron Company with the West Hartlepool Steel & Iron Co. created the South Durham Steel & Iron Co. in 1898. 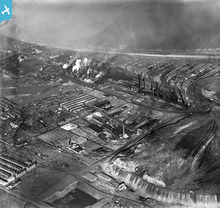 The whole area suffered during the Depression of the 1930s, but there was a brief period of recovery in the post-war years, until British Steel closed the plant in 1977 with the loss of 1,500 jobs. The Tubes Division remains extant (Tata Steel Europe). This should read "Looking north-east towards Hartlepool Bay..."